Gillian Garr, She's a Rebel: The History of Women in Rock and Roll. New York: Seal Press, 1992. 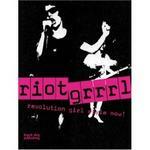 Nadine Monem (ed), Riot Grrrl: Revolution Girl Style Now!, London: Black Dog Publishing, 2007. Marion Leonard, Gender in the Music Industry: Rock, Discourse and Girl Power, Aldershot: Ashgate, 2007. Jannika Bock, Riot Grrrl: A Feminist Re-Interpretation of the Punk Narrative, (place of publication? ): VDM Verlag Dr. Mueller, 2008. Joanne Gottlieb and Gayle Wald, "Smells Like Teen Spirit: Riot Grrrls, Revolution and Women in Independent Rock", in Andrew Ross and Tricia Rose (eds) Microphone Fiends: Youth Music and Youth Culture, London: Routledge, 1994, pp.250-74. Mary Celeste Kearney, "The Missing Links: Riot Grrrl-Feminism-Lesbian Culture", in Sheila Whiteley (ed) Sexing the Groove: Popular Music and Gender, London: Routledge, 1997, pp.207-29. Marion Leonard, "'Rebel Girl, You Are the Queen of My World': Feminism, 'Subculture' and Grrrl Power", in Sheila Whiteley (ed) Sexing the Groove: Popular Music and Gender, London: Routledge, 1997, pp. 230-55. Theo Cateforis and Elena Humphreys, "Constructing Communities and Identities: Riot Grrrl New York City", in Kip Lornell and Anne K. Rasmussen (eds) Musics of Multicultural America: A Study of Twelve Musical Communities , New York: Schirmer, 1997, pp.317-42. Evelyn McDonnell, "Rebel Grrrls", in Barbara O'Dair (ed) Trouble Girls: The Rolling Stone Book of Women in Rock, New York: Random House, 1997, pp.453-63. Mary Celeste Kearney, "'Don't Need You! ': Rethinking Identity Politics and Separation for a Grrrl Perspective". In Jonathan S. Epstein (ed), Youth Culture: Identity in a Postmodern World. Molder, MA: Beachwell, 1998, pp.148-188. Marion Leonard, "Paper Planes: Travelling the New Grrrl Geographies", in Tracey Skelton and Gill Valentine (eds)Cool Places: Geographies of Youth Cultures, London: Routledge, 1998, pp.101-18. Jessica Rosenberg and Gitana Garofalo, "Riot Grrrl: Revolutions from Within", Signs: Journal of Women in Culture and Society, 23(3), 1998, pp.809-41. Catherine Driscoll, "Girl Culture, Revenge and Global Capitalism: Cybergirls, Riot Grrls, Spice Girls", Australian Feminist Studies , 14(29), 1999, pp.173-93. Alison Jacques, "You Can Run but You Can't Hide: The Incorporation of Riot Grrrl into Mainstream Culture", Canadian Women's Studies, 20(4), 2001, pp.46-51. Kristen Schilt, "'A Little Too Ironic': The Appropriation and Packaging of Riot Grrrl Politics by Mainstream Female Musicians", Popular Music and Society, 26(1), 2003, pp.5-16. Kristen Schilt, "'Riot Grrrl Is...': The Contestation over Meaning". In Andy Bennett and Richard A. Peterson (eds), Music Scenes: Local, Translocal, and Virtual. Nashville: Vanderbilt University Press, 2004, pp.115-130. Kristen Schilt, "'The Punk White Privilege Scene': Riot Grrrl, White Privilege, and Zines", in Jo Reger (ed) Different Wavelengths: Studies of the Contemporary Women’s Movement. New York and London: Routledge, 2005, pp. 39-56. Mary Celeste Kearney, “Brought to You by Girl Power: Riot Grrrl's Networked Media Economy," in Mary Celeste Kearney, Girls Make Media. New York and London: Routledge, 2006, pp. 51-89. Anna Feigenbaum, "Remapping the Resonances of Riot Grrrl: Feminisms, Postfeminisms, and “processes” of Punk", in Yvonne Tasker and Diane Negra (eds) Interrogating Postfeminism: Gender and the Politics of Popular Culture. Durham: Duke University Press, 2007, pp. 132-152. Marion Leonard, "The riot grrrl network: grrrl power in indie rock", in Marion Leonard, Gender in the Music Industry:Rock, Discourse and Girl Power. Aldershot: Ashgate, 2007, pp.115-136. Marion Leonard, "The development of riot grrrl: through zines, the internet and across time", in Marion Leonard, Gender in the Music Industry:Rock, Discourse and Girl Power. Aldershot: Ashgate, 2007, pp.137-162. Schilt, Kristen and Elke Zobl, "Connecting the Dots: Riot Grrrls, Ladyfests, and the International Grrrl Zine Network", in Anita Harris (ed) Next Wave Cultures: Feminism, Subcultures, Activism. New York: Routledge, 2008, pp. 171-192. Chelsea Starr, "Because: Riot Grrrl, Social Movements, Art Worlds, and Style". Unpublished PhD Theses, Irvine: University of California, 1999. Kerri Koch (dir),Don't Nedd You: The Herstory of Riot Grrrl, Urban Cowgirl Productions, 2006.